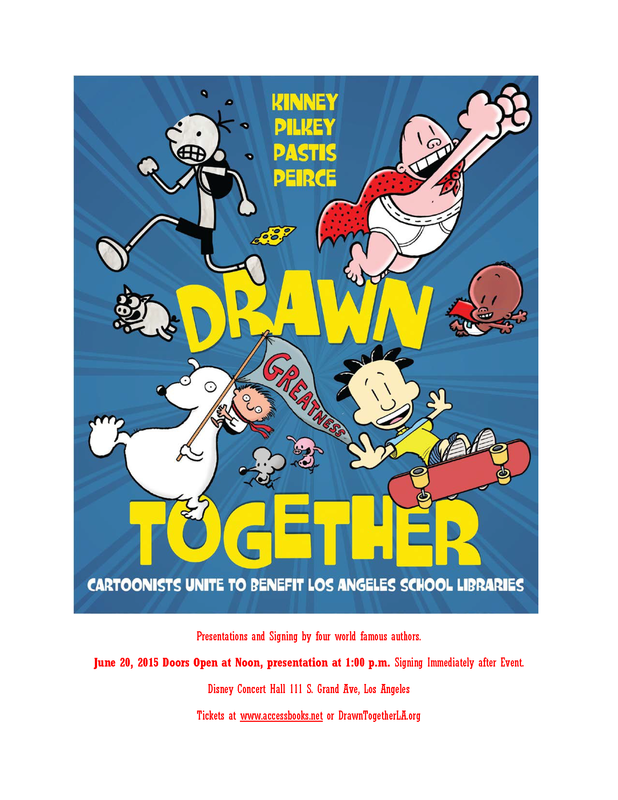 Drawn Together: Kid Book Authors Kinney, Pilkey, Peirce & Pastis to Benefit LA Libraries! Come for a great family day with world famous authors. Children will be delighted to see and meet their favorite authors! Drawn Together unites storytellers from around the country to support Access Books and school libraries. This once-in-a-lifetime event features four famous children’s book authors and illustrators: Jeff Kinney (Diary of a Wimpy Kid), Dav Pilkey (Captain Underpants), Lincoln Peirce (Big Nate), and Stephen Pastis (Timmy Failure & Pearls Before Swine). During Drawn Together, the authors will discuss writing, drawing, and the creative process. Hosted by Julie Bowen of Modern Family. All proceeds benefit Access Books (www.accessbooks.net). Currently, the state of California provides NO funding for school libraries. To augment or update a collection, schools must do in house funding. For most schools who server children living in poverty, this is untenable. This results in libraries with outdated collections and few books per child. Books can be as old as copyrighted 1950. There are no copies of current titles. Access Books provides refurbishes the library and provides new, high interest books. This entry was posted in Announcements and tagged Access Books, books, Books for Kids, Dav Pilkey, Drawn Together, Fundraiser, Jeff Kinney, Julie Bowen, kids and families, LA Libraries, Lincoln Peirce, Modern Family, special event, Stephen Pastis by gomama. Bookmark the permalink.